Ramaswami started the Mitty Advocacy Project. WASHINGTON, DC: Sruthi Ramaswami, an 18-year-old from Los Altos, California, has been announced as one of the 14 winners of the prestigious 2013 Gloria Barron Prize for Young Heroes. 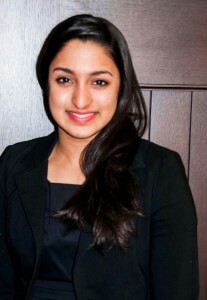 Ramaswami was recognized for her advocacy efforts to get more young people involved in political issues. She founded the Mitty Advocacy Project (MAP), and her work through MAP — at the local, state, and federal levels of government — led to her to being recognized by the Gloria Barron organization. She named the organization “Mitty” after her high school, the Archbishop Mitty Catholic High School in San Jose. MAP has grown to comprise roughly 100 students at Ramaswami’s high school alone, and has spread to more than 50 schools across the country. The entire MAP network consists of over 1,000 students; these young political advocates have lobbied in Sacramento (the state capitol of California) and even Washington, DC. Students involved with MAP have lobbied for six separate pieces of legislation, and five of those have already been signed into law. Ramaswami also started the California Youth Advocacy Day, a three year-old annual event that promotes active involvement and engagement with politics and lawmakers. The event has attracted the participation of at least 600 high school students throughout the state. As a high school freshman, she also started Catholic Lobby Day, an effort co-initiated by a teacher of hers to encourage Catholics to get more involved in politics. The winners of the Gloria Barron Prize each receive $5,000 to use towards either funding their higher education pursuits or their service projects. Earlier this year, Ramaswami also won $1,000 worth of scholarship money from the local San Francisco ABC affiliate station for being one of seven exceptional high school seniors the station chose to honor. The video can be viewed below. Sruthi, who is also a student of classical Carnatic music, is currently a freshman at the University of Chicago, where she is studying economics.